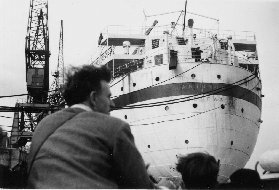 In November 1948 Thomas and Millie Wilkinson and their two children, Gordon and Rosemary, travelled from Belfast via Liverpool then Southampton where they boarded the Asturias for their journey to Australia to settle in Geelong, Victoria. Thomas kept a very detailed diary of their trip which his family had bound and presented to him shortly before his death in 1989. The diary (left) contains many photos taken on board and vivid descriptions of their month at sea. "The first impression was that of a Wild West town with the funny little railway engines with a very hoarse whistle. The veranda covering the sidewalk, the wooden buildings, mostly single storey &c..... we boarded a bus for Perth....the children had an iced drink (called a spider in Australia) and some cream cakes. They both immediately said that they liked Australia....."
Thomas Wilkinson's story was submitted by Gordon Wilkinson. He can be contacted via the website administrator. Oct 1948. "We got away to a good start, with the weather perfect and calm in the Irish Sea, arriving Liverpool in the best of spirits..."